A new action-packed adventure series for young fans of Alex Rider and Jason Bourne--with the first four books publishing simultaneously. Binge read for summer! Teenage kickboxing champion Connor Reeves is determined to do his father, a former special forces soldier, proud. Recruited into the ranks of a top-secret young bodyguard squad known as Guardian, Connor trains in surveillance, anti-ambush exercises, hostage survival and unarmed combat. Whatever it takes to prepare him for the dangerous missions ahead. But nothing can prepare Connor for his first assignment when the US president summons him to protect the First Daughter. For not even the Secret Service knows that a terrorist sleeper cell has been activated in America. Its mission: to take the president’s daughter hostage. 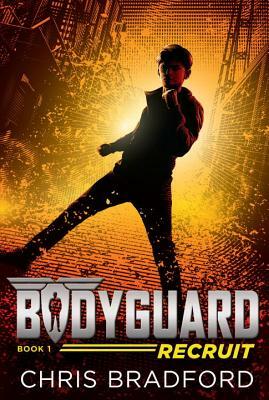 Combining pulse-pounding action, diabolical enemies, and an insider's knowledge of the tricks of the trade, the BODYGUARD series is the perfect target for fans of Alex Rider, James Bond, 24, and Jason Bourne. Chris Bradford (www.chrisbradford.co.uk) is a true believer in "practicing what you preach." For his BODYGUARD series, Chris embarked on an intensive close protection course to become a qualified professional bodyguard. His bestselling books, including the Young Samurai series, are published in over 20 languages and have garnered more than 30 children's book award nominations internationally. He is a dedicated supporter of teachers and librarians in their quest to improve literacy skills and provides free Teachers' Guide to his books on his website. He lives in England with his wife and two sons. Follow Chris on Twitter @youngsamurai.